ICU indicates intensive care unit; SOFA, Sequential Organ Failure Assessment. Blood glucose measurements were not available at 8 AM for 3 patients receiving intensive insulin and for 2 receiving conventional glucose therapy. The error bars indicate 95% confidence intervals. To convert mg/dL to mmol/L, multiply by 0.0555. Context Corticosteroid therapy induces potentially detrimental hyperglycemia in septic shock. In addition, the benefit of adding fludrocortisone in this setting is unclear. Objectives To test the efficacy of intensive insulin therapy in patients whose septic shock was treated with hydrocortisone and to assess, as a secondary objective, the benefit of fludrocortisone. Design, Setting, and Patients A multicenter, 2 × 2 factorial, randomized trial, involving 509 adults with septic shock who presented with multiple organ dysfunction, as defined by a Sequential Organ Failure Assessment score of 8 or more, and who had received hydrocortisone treatment was conducted from January 2006 to January 2009 in 11 intensive care units in France. Interventions Patients were randomly assigned to 1 of 4 groups: continuous intravenous insulin infusion with hydrocortisone alone, continuous intravenous insulin infusion with hydrocortisone plus fludrocortisone, conventional insulin therapy with hydrocortisone alone, or conventional insulin therapy with intravenous hydrocortisone plus fludrocortisone. Hydrocortisone was administered in a 50-mg bolus every 6 hours, and fludrocortisone was administered orally in 50-μg tablets once a day, each for 7 days. Main Outcome Measure In-hospital mortality. Results Of the 255 patients treated with intensive insulin, 117 (45.9%), and 109 of 254 (42.9%) treated with conventional insulin therapy died (relative risk [RR], 1.07; 95% confidence interval [CI], 0.88-1.30; P = .50). Patients treated with intensive insulin experienced significantly more episodes of severe hypoglycemia (<40 mg/dL) than those in the conventional-treatment group, with a difference in mean number of episodes per patient of 0.15 (95% CI, 0.02-0.28; P = .003). At hospital discharge, 105 of 245 patients treated with fludrocortisone (42.9%) died and 121 of 264 (45.8%) in the control group died (RR, 0.94; 95% CI, 0.77-1.14; P = .50). Conclusions Compared with conventional insulin therapy, intensive insulin therapy did not improve in-hospital mortality among patients who were treated with hydrocortisone for septic shock. The addition of oral fludrocortisone did not result in a statistically significant improvement in in-hospital mortality. Thus, we hypothesized that normalization of blood glucose levels with intensive insulin treatment may improve the outcome of adults with septic shock who are treated with hydrocortisone. We examined, as a secondary objective, the benefit of adding fludrocortisone to hydrocortisone therapy. The Corticosteroids and Intensive Insulin Therapy for Septic Shock (COIITSS) trial was a multicenter, randomized, 2 × 2 factorial, open-label trial comparing intensive insulin therapy with conventional blood glucose control among patients with septic shock who were treated with corticosteroids. The secondary objective was to compare hydrocortisone plus fludrocortisone with hydrocortisone alone. We did not expect any interaction between insulin and fludrocortisone. The study protocol was approved by the Comité de Protection des Personnes de Saint Germain en Laye on May 24, 2005. Written informed consent was obtained from the patients or their next of kin. All adults admitted to 1 of the 11 participating intensive care units in France (eTable) were recruited if they or their next of kin gave consent and they had (1) criteria for severe sepsis as defined by the American College of Chest Physicians/Society of Critical Care Medicine,12 (2) multiple organ dysfunction as defined by a Sequential Organ Failure Assessment (SOFA) score of 8 or more,13 (3) need for vasopressor therapy (any dose of dopamine, adrenaline, noradrenalin, or any other vasoconstrictor agent) to maintain systolic blood pressure higher than 90 mm Hg or mean blood pressure higher than 60 mm Hg, and (4) were receiving 50 mg of hydrocortisone intravenously every 6 hours as an adjunct therapy for septic shock. We excluded pregnant women and moribund patients (those expected to die within the day of their ICU admission). Randomization was centralized through a secured Web site and stratified according to center, using permutation blocks, the size of which was not available to clinicians. Each patient was randomly allocated to receive 1 of the 4 following treatment combinations: intensive insulin treatment and hydrocortisone, intensive insulin treatment and hydrocortisone plus fludrocortisone, conventional glucose control and hydrocortisone, and conventional glucose control and hydrocortisone plus fludrocortisone. The treatment by hydrocortisone was standardized across the centers. Hydrocortisone was prepared in vials containing 100 mg of hydrocortisone hemisuccinate powder with ampules containing 2 mL of sterile water diluent. All patients received a 50-mg intravenous bolus of hydrocortisone every 6 hours for 7 days. In the experimental group, the insulin (human recombinant insulin, vials of 10 mL containing 100 U/mL) titration was to follow strictly the recommendations adapted from the original study by Van den Berghe et al.8 The protocol is detailed in the eSupplement. Blood samples for glucose measurement were obtained by means of arterial catheters. Blood glucose levels were measured on arterial samples with the use of arterial blood gas analyzers or laboratory analyzers routinely used at the participating centers. 9-α-Fludrocortisone was prepared as 50-μg tablets. Those in the experimental group received 1 tablet via nasogastric tube every morning at 8 AM for 7 days. Patients in the control group received hydrocortisone therapy alone. Organ system failure was defined for each of the 6 major organ systems as a SOFA score of 3 or 4 points (on a scale of 0-4 for each organ system, for an aggregate score of 0-24, with higher scores indicating more severe organ dysfunction).13Reversal of shock was defined as the maintenance of a systolic blood pressure of at least 90 mm Hg without vasopressor support for at least 24 hours. Superinfection was defined as a new infection occurring 48 hours or more after the initiation of a study drug. New sepsis was defined as a new septic episode with microbiologic confirmation. New septic shock was defined as a new episode of septic shock after reversal of the initial episode. Nonresponders to a corticotropin test were patients whose cortisol level failed to increase by more than 9 μg/dL15 (to convert to nanomoles per liter, multiply by 27.588). We systematically recorded at baseline demographic and anthropometric data; time of hospital and ICU admission; patient's location prior to ICU admission (community, hospital, long-term care facility); comorbid conditions as categorized by the Acute Physiology and Chronic Health Evaluation (APACHE)16 disability scale and McCabe class17; severity of illness as assessed by vital signs, the Simplified Acute Physiology Score (SAPS) II,18 and the SOFA score; type and dose of any antibiotics given to the patient the week preceding inclusion into the study; type and dose of vasopressors and inotropic drugs; need for renal replacement therapy; time from shock onset; time from initiation of corticosteroid therapy; and use of adjunctive treatments such as activated protein C. The following laboratory variables were also systematically recorded: arterial blood glucose and lactate levels, Gram examination and cultures of samples collected from any suspected site of infection, and total cortisol levels before and 60 minutes after administration of a 250-μg intravenous bolus of corticotrophin. The primary outcome measure was in-hospital mortality (or 90-day mortality, whichever occurred first). Secondary outcomes included 28-, 90-, and 180-day mortality rates; number of vasopressor and mechanical ventilation−free days; time to reach a SOFA score of less than 8; ICU and hospital length of stay; and serious adverse events, including any episode in which arterial blood glucose levels decreased to less than 40 mg/dL; superinfection; presence of muscle weakness at ICU discharge or at the 90- or 180-day follow-up; or the presence posttraumatic stress disorders at the 180-day follow-up. Outcomes were investigated in the subgroup of patients who did not respond to corticotrophin. We estimated 50% in-hospital mortality among patients with septic shock who became dependent on vasopressor and were treated with hydrocortisone.3 Using a bilateral formulation, we calculated that 254 patients per group were needed to detect an absolute reduction of 12.5% of in-hospital mortality (α = .05 and study power at 80%) with intensive insulin therapy, corresponding to 25% relative risk (RR) reduction, ie, less than the 32% RR reduction suggested by the trial of Van den Berghe et al.8 The comparison of hydrocortisone to hydrocortisone plus fludrocortisone was a secondary objective and was not taken into account in the sample-size computation. The statistical analysis involved only 1 statistical analysis, an intent-to-treat analysis, performed by an independent statistician after all patients had completed the study follow-up sessions. Active tracing of patients was performed using hospital administrative data, which prevented patients from being lost to follow-up. Categorical variables were compared by Fisher exact tests and continuous variables by nonparametric Kruskal-Wallis tests or regression mixed-effects models whenever appropriate. The cumulative incidence of in-hospital death was compared using the Gray test,31 and adjusted comparison using predictors identified among baseline characteristics was performed by the Fine and Gray regression model.32 Overall survival was estimated using the Kaplan-Meier method, and benefit of each randomization was estimated by using Cox models stratified on the other randomization group. Interaction between both randomizations and between-treatments effect and response to corticotrophin tests were assessed using the Gail and Simon33 heterogeneity test. Assumption of proportionality for the Cox model was checked.34 Finally, to assess the difference in the control of blood glucose across randomized groups, we fitted a linear mixed-effects model.35 This allowed modeling observational heterogeneity incurred by repeated measurements of glucose levels and insulin doses over time in the same patient and accounted for the fixed and random nature of the study factors. All tests were 2-sided. A P value of .05 was considered statistically significant. The only comparisons that were performed are those reported in the article. All were prefixed and scheduled in the protocol, and none of them were performed post hoc. All statistical analyses were performed using the SAS 9.1 (SAS Institute Inc, Cary, North Carolina) and R (http://www.R-project.org) software packages. From January 2006 to January 2009, 946 patients were assessed for eligibility, and 509 were included (Figure 1). The treatment groups were well balanced at baseline (Table 1). None of the patients received etomidate. There was no missing data on the primary outcome variable. Twenty-five patients (4.9%) were lost to follow-up after hospital discharge. Patients in the intensive insulin therapy group had markedly lower blood glucose from the first day through their last day in the ICU than those in the control group (P < 10−5; Figure 2). The median dose of insulin in the experimental group was 71 UI (IQR, 45-96) per day vs 46 UI (IQR, 30-65) in the control group (P < .001). The time spent with glucose levels in the range of 80 to 110 mg/dL was significantly greater in the intensive insulin therapy group than in the control group (P < 10−5). At hospital discharge, 117 of 255 patients (45.9%) in the experimental group died (95% confidence interval [CI], 39.9%-52.0%) and 109 of 254 patients (42.9%) in the control group died (95% CI, 37.0%-49.1%; P = .50; Table 2). The RR of dying while in the hospital was 1.07 (95% CI, 0.88-1.30). There was no evidence for interaction with fludrocortisone treatment (RR, 0.89; 95% CI, 0.65-1.21 in the hydrocortisone plus fludrocortisone group; RR, 0.91; 95% CI, 0.66-1.26 in the hydrocortisone group; P = .31). No significant difference existed between treatment groups for any of the secondary outcome measures (Table 2). The hazard ratio of death was 1.04 (95% CI, 0.8-1.34; P = .78; eFigure. In the a priori defined subgroup of nonresponders to corticotrophin, there was no evidence of a difference in mortality between the 2 groups. The median number of days that surviving patients spent in the ICU was 10 for those in the experimental group vs 9 for those in control group (P = .68); the median length of stay in the hospital was 24 days for the experimental group vs 22 days for those in the control group (P = .87); the median vasopressor-free days for each group was 4 days (P = .58); and the median mechanical ventilation-free days was 10 for the experimental group vs 13 days for the control group (P = .51; Table 2). The cumulative incidence of a SOFA score of less than 8 did not differ between groups (64.3% for the experimental group vs 60.6% for the control group; P = .38). The proportion of superinfections (P = .66) and the MDRS score (P = .06) were also similar between the 2 groups. Forty-two of 255 patients (16.4%) receiving intensive insulin experienced severe hypoglycemic episodes vs 20 of 254 (7.8%) in the control group (P = .003). Patients receiving intensive insulin has a mean (SD) number of hypoglycemic episodes of 0.29 (0.90) vs 0.14 (0.58) for those in the control group (P = .003; Table 3). Patients who had hypoglycemia died at a similar rate: 45.2% receiving intensive insulin vs 50% receiving conventional glucose treatment. At hospital discharge, 105 of 245 patients (42.9%) died in the fludrocortisone-treated group and 121 of 264 patients (45.8%) in the control group died (P = .50). The RR of dying in the hospital was 0.94 (95% CI, 0.77-1.14). No significant difference in overall mortality existed between the fludrocortisone-treated patients and the controls (hazard ratio, 0.94; 95% CI, 0.73-1.21; Table 2 and eFigure. In the subgroup of nonresponders, no significant difference in mortality existed between treatment groups. Nor did significant differences exist between the 2 groups for the survivors' ICU (P = .52) and hospital (P = .052) lengths of stay, for the number of vasopressor-free days (P = .62), and for mechanical ventilation-free days (P = .50; Table 2). The cumulative incidence of a SOFA score less than 8 was not different between the treatment groups (P = .75). However, significantly more patients experienced superinfection in the fludrocortisone group than in the control group (P = .02). Patients receiving fludrocortisone experienced more urinary tract superinfection than the control group; however, the rate of lung, abdominal, or blood stream superinfection was much the same between the groups (Table 3). The proportion of deaths among patients with superinfection was also comparable (Table 3). Similarly, the MDRS scores were much the same at day 28 (P = .10; Table 3). The current study showed no evidence to support a strategy of intensive insulin therapy aimed at maintaining blood glucose levels in the range of 80 to 110 mg/dL for treating septic shock with corticosteroids. Furthermore, no evidence supports the routine use of oral fludrocortisone. This study enrolled patients with septic shock who were treated with low-dose corticosteroids, in accordance with the 2004 Surviving Sepsis Campaign guidelines.14 Of note, patients' severity of illness, as assessed by SAPS II scores and crude mortality rate, was very similar to those of patients enrolled in the Ger-Inf-05 trial3 and greater than patients in the Corticosteroid Therapy of Septic Shock (CORTICUS) study.4 These findings suggest that in participating hospitals, physicians treated the sickest patients with corticosteroids in anticipation of the updated Surviving Sepsis Campaign recommendations.5 The observed mortality was concordant with the benefit from corticosteroids reported in the Ger-Inf-05 trial.3 Otherwise, the study population mimicked common characteristics of septic shock.1 The study was powered to detect a 12.5% absolute risk reduction of mortality with tight glucose control, corresponding to a 25% RR reduction. This estimate was based on the best evidence available at the time the study was designed. Indeed, the trial by Van den Berghe et al8 suggested an RR reduction of 32%. In addition, most of the recent large clinical trials in septic shock, including the Vasopressin and Septic Shock (VASST),36 CORTICUS,4 and Efficacy of Volume Substitution and Insulin Therapy in Severe Sepsis (VISEP)9 trials were designed to detect a very similar absolute difference in mortality. As expected, hydrocortisone at a dose of 50 mg every 6 hours was associated with higher basal blood glucose levels than in the VISEP9 or the Normoglycemia in Intensive Care Evaluation–Survival Using Glucose Algorithm Regulation (NICE-SUGAR) trials10 and more in the range of levels reported in the trial by Van den Berghe and colleagues.8 In the current study, blood glucose levels decreased in both treatment groups on the first day of randomization. We aimed at comparing tight glucose control to usual care rather than comparing 2 different strategies of blood glucose control. Usual care should follow the 2004 Surviving Sepsis Campaign guidelines.14 Then, in the experimental group, blood glucose levels decreased markedly compared with the conventional-treatment group, in which levels were maintained at approximately 150 mg/dL in accordance with recommendations.14 The median doses of insulin in both groups were very similar to those observed in the Van den Berghe trial,8 thus, suggesting that the investigators involved in our trial likely followed the glucose control algorithm. The NICE-SUGAR trial suggested that patients who were receiving corticosteroids might benefit from tight glucose control.10 In contrast, in corticosteroid-treated septic shock, this study found no evidence that intensive insulin therapy to achieve normoglycemia was superior to insulin therapy in maintaining blood glucose levels at 150 mg/dL or less. Of note, compared with the conventional-treated group in this study, during the first week after randomization in the Ger-Inf-05 study, the mean (SD) blood glucose levels were markedly higher, ranging between 186 (83) and 220 (110) mg/dL.3,11 Thus, this study cannot exclude the benefit of some glucose control compared with no control at all in corticosteroid-treated septic shock. As reported in previous studies,9,10 the intensive insulin therapy did not prevent major ICU-acquired complications such as superinfection or muscle weakness. The use of fludrocortisone in addition to hydrocortisone was debated in recent years. On the one hand, a dose of 200 mg per day of hydrocortisone may likely provide enough mineralocorticoid activity.5 On the other hand, the 11 β-hydroxysteroid dehydrogenase type II enzyme that inactivates cortisol to prevent its binding to mineralocorticoid receptors may be up-regulated in sepsis.37 The use of fludrocortisone was also suggested as a potential explanation for the difference in outcome benefits observed in the Ger-Inf-05 trial3 and in the CORTICUS trial.4 In the current study, there was no significant difference in any outcome between patients treated with or without fludrocortisone. The direction of the point estimate may favor the use of fludrocortisone, but the size of the effect was small. Physicians and nurses were not blinded when administering fludrocortisone, and a placebo was not available for technical reasons. In addition, the decision to randomly allocate the patients to fludrocortisone was because the 2004 Surviving Sepsis Campaign left this treatment as optional.14 Then, we thought that this was the best way to prevent heterogeneous use of fludrocortisone across participating sites. Further trials should be powered to detect a 10% RR reduction in mortality, as observed in the current exploratory trial, or they should investigate the benefits vs the risks of intravenous fludrocortisone. In conclusion, the current study does not support the hypothesis that intensive insulin therapy to maintain blood glucose levels in the range of 80 to 110 mg/dL reduces the RR of death by 25% in patients whose septic shock is treated with hydrocortisone. The current data do not support the routine use of oral fludrocortisone in addition to hydrocortisone when physicians decide to introduce corticosteroids in the management of a patient with septic shock. Corresponding Author: Djillali Annane, MD, Critical Care Department, Hôpital Raymond Poincaré, Assistance Publique–Hôpitaux de Paris, Université de Versailles SQY, 104, Boulevard Raymond Poincaré, 92380 Garches, France (djillali.annane@rpc.aphp.fr). Author Contributions: Dr Annane had full access to all of the data in the study and takes responsibility for the integrity of the data and the accuracy of the data analysis. Study concept and design: Annane, Chevret. Acquisition of data: Annane, Cariou, Mathonet, Maxime, Azoulay, Mayaux, D’honneur, Amathieu, Timsit, Tabah, Cohen, Clec’h, Wolf, Fartoukh, Adrie, Santré, Bollaert, Lejeune. Analysis and interpretation of data: Annane, Maxime, Azoulay, Timsit, Bollaert, Lejeune, Chevret. Drafting of the manuscript: Annane, Cariou, Timsit, Lejeune. Critical revision of the manuscript for important intellectual content: Annane, Maxime, Mathonet, Azoulay, Mayaux, D’honneur, Amathieu, Timsit, Tabah, Cohen, Clec’h, Wolf, Fartoukh, Adrie, Santré, Bollaert, Lejeune, Chevret. Statistical analysis: Annane, Lejeune, Chevret. Administrative, technical, or material support: Annane, Cariou, Maxime, Chevret. Study supervision: Annane, Maxime, Azoulay, Wolf, Bollaert. 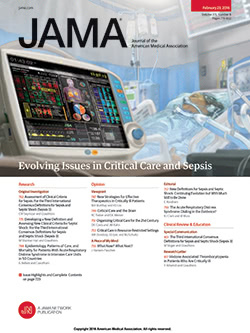 Study Organization and Investigators are available at http://www.jama.com. Funding/Support: Assistance Publique–Hôpitaux de Paris was the study sponsor. Role of the Sponsor: The study sponsor took full administrative responsibility but had no role in the recruitment of patients, in the management, analysis or interpretation of the data or in the preparation, review, or approval of the article.